What is the difference between the DK8 and the DK14? The revolutionary "building block" design of Strata DK systems lets you start small and add on as your business grows. The difference between	the DK8 and the DK14 is that the DK8 does not handle Caller ID, or Computer Telephony Integration. The DK8 was replaced by the DK14. The Strata DK14 provides capacity for up to 4 CO lines, 8 digital telephones, and 2 analog station ports for faxes, voice mail, etc. What is the difference between the DK16, DK16e, and the DK40, DK40i? The Strata DK16 provides capacity for up to 8 CO lines and 16 telephones. It does not offer the advanced features such as; Caller ID, Computer Telephony Integration, Direct Inward Dialing (DID), and Dialed Number Identification Service (DNIS). The DK16 has been replaced by the DK16e. The DK16e provides capacity for up to 8 CO lines and 16 telephones. It does offer the advanced features such as; Caller ID, Computer Telephony Integration, Direct Inward Dialing (DID), and Dialed Number Identification Service (DNIS). The DK16e has been replaced by the DK40. The Strata DK40 provides capacity for up to 12 CO lines and 28 telephones including many combinations of digital and analog stations. 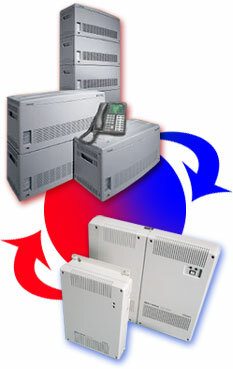 With the Strata DK40 systems, you can grow and expand to meet your changing needs easily and cost effectively. It offers all the advanced features such as; Caller ID, Computer Telephony Integration, Direct Inward Dialing (DID), and Dialed Number Identification Service (DNIS). The DK40 has been replaced by the DK40i. The Strata DK40i provides capacity for up to 12 CO lines and 28 telephones including many combinations of digital and analog stations. With the Strata DK40i systems, you can grow and expand to meet your changing needs easily and cost effectively. The DK40i adds features for Integrated Services Digital Network (ISDN). Tie lines to connect another telephone system in a private communications network. Direct Inward System Access, which saves money by allowing employees to use the company’s calling network even when they are not in the office, and finally, ground start lines capability. This upgrade kit will allow your DK16e further expansion from its original configuration for additional CO lines. Installation instructions are included. What is the difference between the DK280 and the DK424? The DK280 system allows you to start out small with one telephone cabinet that provides for 24 CO Lines or 32 telephones, and grow to a six cabinet system that provides capacity for 144 CO Lines or 240 telephones. With the Strata DK280 you can grow and expand to meet your changing needs easily and cost-effectively. The DK280 has been replaced by the DK424. please call our Support Line at 877-892-2666.